GELID Solutions adds a 28mm high 1U ultra slim CPU Cooler with a high quality heatpipe and premium copper plate to its quiet product line. The Slim Silence iPlus is specifically designed to fit Intel's most popular sockets such as 775/1156 and 1155. 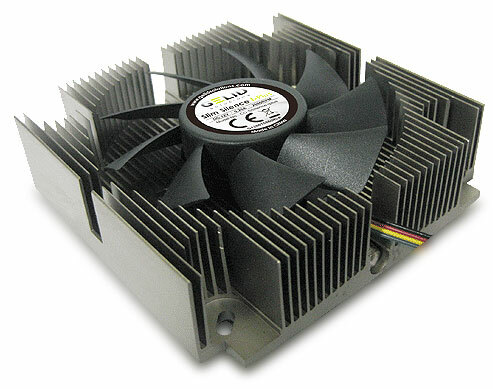 This petite cooler supports an incredible CPU thermal design power (TDP) of up to 82W with good case ventilation. With a compact heatsink design for Mini ITX, Micro ATX, ATX, HTPC, Panel PC, Car PC and 1U server the Slim Silence iPlus is equipped with a high performance heatpipe, premium copper plate and a very quiet fan. Thanks to the small but high performance heatpipe and a pure copper plate, the Slim Silence i-Plus ensures fast and efficient heat transfer from the CPU core to the aluminium fins. The frameless quiet fan features ball bearings and a GELID intelligent 4-pin PWM (Pulse Width Modulation) speed control which ensures a quiet operation at low CPU temperatures. *Please check installation manual and size restriction drawing. If fitting to a motherboard in a SuperMicro SC512F-350 1U case, the underside fixing nuts are too thick; normal electrical M3.5 nuts just about fit as a workaround. The fan's noise level is higher once the case lid is on; it's more noisy than I'd hoped, but acceptable cooling a 45W Intel Xeon E3-1265L V3 Haswell in a 1U case. It's certainly much quieter than using the case's stock jet-type blowers with a fanless heatsink. CPU temperature over the few days it's been running has been between 54 and 61 C (with fan speed typically at 1300-1400 RPM); although it's not been pushed too hard yet. The case is in a 12U rack cupboard with open back (and a few other devices) in a room that's around 20 C. I haven't had to resort to using any case or rack fans, yet. Bought to replace a Scythe Shuriken in my HTPC. The stupid push-pin mounting system on the Scythe refused to remain securely attached after an enforced motherboard swap, so I was specifically looking for something with screw mountings. 1) The length/width extend slightly outside of the area guaranteed to be clear on the motherboard. With my Intel DH57DD board, there was a small capacitor in the way that needed a little 'adjustment' to get the heatsink fitted. 2) The fan is not at all quiet. Entirely unacceptable for a HTPC in a living room. I have the fan running at ~1300rpm which keeps my i3-530 at about 60C during video playback. And as the fan doesn't really cool the VRMs on the motherboard, they were running at 70C. Given those figures, it is hardly worth trying to tweak the fan speed any lower to improve the noise. Better to start again with something more suitable for the task. So in summary, a decent heatsink if you really need it to be 1U height and don't really care about the noise. If not, I'd look elsewhere. Ich suchte nach einem sehr flachen Kühler für meinen Heimkino-PC. Ein schönes Teil. Wirklich gut verarbeitet. Gräbt den Speicher- und PCI-Steckplätzen nicht das Wasser ab. Von der Grundfläche her entspricht er den gängigen Kühlern für Intel-Prozessoren, ist aber viel flacher. Gute Abmessungen und Formgebung. Lässt sich wirklich leicht einbauen und wird bereits mit Wärmeleitpaste bestrichen geliefert. Ist wirklich leise. Da fällt mir wirklich kaum was ein. Ein Topp-Produkt. Ich wünschte nur, Intel wäre in der Lage, etwas so Sinnvolles herzustellen wie dieser Originalgerätehersteller.